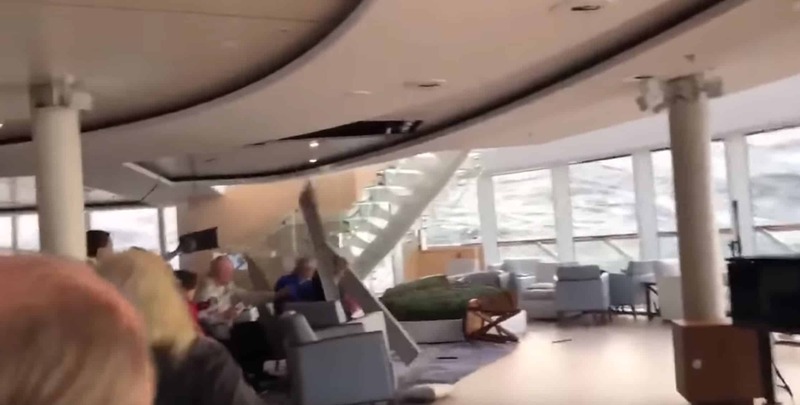 New shocking video footage has been posted from onboard the Viking Sky cruise ship while being hit with high winds and waves off Norway. Throughout all of this, our first priority was for the safety and wellbeing of our passengers and our crew. We would like to thank the Norwegian Redningssentral and the Norwegian emergency services for their support and skill displayed in managing the situation in very challenging weather conditions. We would also like to thank the local residents who throughout the whole process have been extremely supportive and hospitable. Viking Sky which is operated by Viking Ocean cruises is suffering from major engine failure and as a result, lost power and became stranded off the Norwegian coast. The ship also put out a mayday call. New shocking video footage has been posted from onboard as the vessel was being hit with 38-knot winds and high waves. As this is developing news the situation is constantly changing as the evacuation process of 1,300 guests continues. The Norwegian Coast Guard is involved in a major operation after the Viking ocean cruises lost engine power on Saturday, March 23. You can read our post from yesterday when the news first broke of Viking Sky adrift off the Norwegian west coast in Hustadvika, Norway. 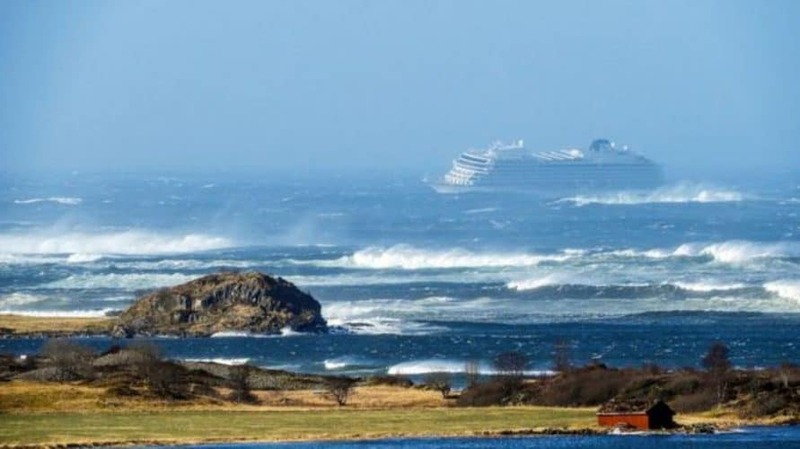 On March 23rd at 2:00 pm (Norwegian time) the Viking Sky experienced a loss of engine power off the coast of Norway near Molde. Our first priority was for the safety and wellbeing of our passengers and our crew, and in close cooperation with the Norwegian Coast Guard, the captain decided to evacuate all guests from the vessel by helicopter. The ship is proceeding on its own power and a tugboat is on site. The evacuation is proceeding with all necessary caution. If you have questions or concerns about any guests onboard please call this number for US/AU booked guests 1-888-889-8837, and for UK booked guests 07585 779 853 or 0208 780 7900. So as stated, power has returned to the ship with tug boats on hand for assistance. Five helicopters are involved in the evacuation and according to reports so far 8 passengers have been injured. The ship now has three out of four engines working. New shocking video footage has been posted from onboard Viking Sky from Twitter user Alexus Sheppard who was on the ship. The footage has already received over 4 million views and shows the ship listing from side to side. Parts of the roof also collapsed onto guests heads as crew members try their best to help but are also struggling from the heavy movement. Guests were waiting to be evacuated at the time. Around 400 people have so far been rescued. At the moment the Viking cruise ship is moving to port with the help of tug boats. Another bad weather system is moving in so it’s a race against time to get the ship safely away with people still onboard including crew members. The cruise line has also stated that the next scheduled sailing from Amsterdam, Netherlands on March 27 has been canceled. The was originally set to sail a Scandinavia & the Kiel Canal cruise and guests booked on that sailing have already been contacted. At the same time, another cruise ship was also hit with engine power issues. A call to Half Moon Cay in the Bahamas was canceled Saturday morning by Holland America Line after its newest cruise ship was adrift and had blackouts. Viking Sky which is a luxury cruise ship operated by Viking Cruises has issued an urgent mayday after losing power and drifting towards the Norway coast. New cruise ship Viking Jupiter has been delivered as the sixth ocean vessel for Viking Cruises. The Longest-Ever Continuous World Cruise Has Been Announced! Viking Cruises has announced the Ultimate World Cruise which is longest ever continuous world voyage lasting a total of 245 days. Find out the world cruise prices and a map of the itinerary.